This post is supposed to look at various innovative multimedia journalism projects. When I looked through the list, I didn’t expect to find so many websites that have a lot of good stuff. In the competitive industry of media, each organisation tries to find new ways of attracting more audience. Multimedia journalism projects tend to host all media practices on the same allotment and make it attractive and useful for people. Here is a little suggestion where you can find a hell of a lot of amazing projects: follow the link to Regina McCombs interesting multimedia projects in 2008 for Poynter Online. 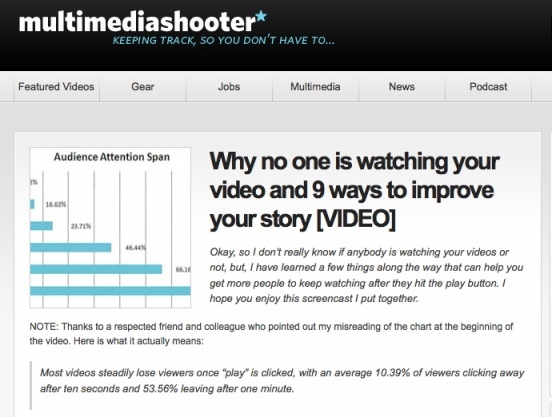 I found some really useful stuff for me as a journalist in multimediashooter. On the main page, I saw ’25 Books every visual journalist should have in their shelf’. After going through the list, I realized that I don’t have any of those books, sadly enough, but I should buy some soon. I’ve moved forward to look through other interesting pieces about iPhone: a storytellers valuable tool, funny journalism videos, the power of story and so on. I immediately added it to my RSS feed, because it’s a significant source for improving my journalism skills. You can even find a ‘JOBS’ section, with lots of internship opportunities. Moving on, I found another interesting project on the Spokesman-Review website, that created Storm Stories. Spokesman- Review is a daily broadsheet based in Spokane, Washington.The project aims to involve the community to contribute with video, photos or stories about weather disasters or about nice neighbourhoods. It’s fun looking through the satellite or hybrid map and click on the highlighted area to see a picture or to read a story. Moreover, it has a help section where you can register to ask for help or volunteer to help someone.So far, a great way to support a real and at the same time virtual, friendly community and engage people to share their best and worst experiences.